Great for any type of function, Corner Cafe is centrally located in Nadi town behind the flagship Jack’s of Fiji store. The venue has the capacity to seat 100 guests comfortably with up to 150 guests allowed for standing functions, giving the freedom to tailor the venue to suit your individual requirements. The Corner Cafe also has a private room that is available for hire for smaller events. The private room has a capacity to accommodate 50 guests for both standing or seated functions. 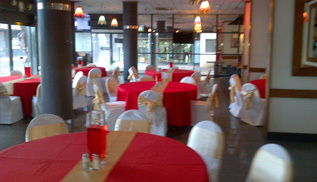 The venue is very versatile and can work with many different styles and layouts, perfect for cocktail style events, sit down dinner, corporate functions and birthday parties.